Peter Newlinds worked for ABC Radio Grandstand for 18 years through the 1990s and 2000s. His name and voice will be familiar to cricket followers around Australia, and also to the followers of many of the various sports the ABC has covered over the years. Peter provides a unique perspective on the life of the broadcaster as someone who may not have been one of the biggest names on radio but nevertheless was always there, someone whose voice was heard routinely on most days over summer as the cricket broadcast went 'around the grounds'. In Around the Grounds, Peter shares memories and insights that will fire sparks of nostalgia in Australian sporting enthusiasts. 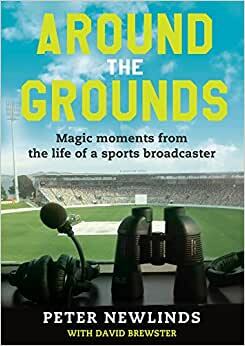 In this marvellous memoir, Peter recalls teenage years working inside the grand scoreboard of the SCG, to the pressure of auditioning for the ABC in front of a childhood hero, and then through a long career with the national broadcaster. It's the story of the sporting fan who manages to live out the ultimate sporting fantasy: working as a commentator with one of the world's great sporting broadcasters. Peter describes his numerous experiences with Grandstand covering everything from international cricket to air-pistol shooting on the outskirts of New Delhi. In doing so he provides the reader with numerous insights into life 'one step away' from the action, working with broadcasting legends and crossing paths with sporting greatness at regular intervals. After reading Around the Grounds, readers will never listen to radio sport coverage in quite the same way again. Start reading Around the Grounds on your Kindle in under a minute. Peter Newlinds grew up in Sydney, listening to the great sporting commentators of the day. He studied Communications in Canberra before joining community sports radio station 2SSS, where he gained grass-roots experience over a number of years including filing reports for the BBC World Service, radio 2GB and SBS television. Peter then moved to the ABC for the next 18 years. Based originally in Sydney and later in Hobart, Peter covered everything from cricket and rugby league to the shooting at two Commonwealth Games and the Sydney to Hobart Yacht Race. Peter has written for ABC Grandstand's collection Unsung Sporting Heroes and Top 10s of Australian Cricket. He now works as a freelancer, continuing to write, work as an MC for sporting events, and do occasional radio spots and commentary duties.